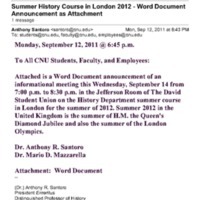 Information on writing intensive courses at CNU. Fall 2006. Information on seminars. 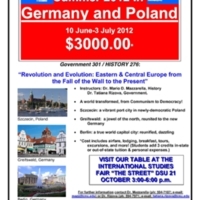 Announcement of HIST 276 to be taught in Munich, Dresden & Berlin the Summer of 2011. 2.24 E Government 301/History 276 "Revolution and Evolution: Eastern & Central Europe from the Fall of the Wall to the Present"
2.24 E Information Meeting: HIST 276 Egypt in the U.K.